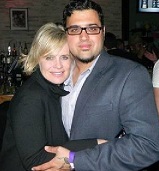 On Wednesday, May 2nd, we will have the honor of chatting with The Bay The Series creator, Gregori Martin and he's bringing the ever so talented Mary Beth Evans! If none of you have seen this webseries, it's a MUST! incomparable Tristan Rogers, Nicolas Coster, Charles Shaughnessy, Jackie Zeman, Matthew Ashford, Jed Allen and Lane Davies to name a few. They just began Season 2, so catch up before Wednesday- www.thebaytheseries.com. Tune in to the interview on Wenesday, May 2nd HERE.